Dogs bred over a decade to protect their flocks and families. Join our Pyrenees Mailing list to receive our newsletter with puppy updates, Pyrenees facts and tips and more! Hoosier, our senior stud at Uptown Farms. Max, our youngest stud. Max came to us from the Ketcham Family who decided to sell their top females and stud to us after 20+ years of raising working Great Pyrenees! Jack at 8 months of age. Two of our females enjoying the first snow of the year! Mace visiting puppies on Christmas morning! We started having Pyrenees only as a protection plan for the sheep. It worked and we stopped losing lambs to predators almost immediately. You cannot be around the Pyrenees without falling in love with the breed. We realized we would never go without the dogs again, so we decided to start raising them. For more than a decade, we have proudly placed working dogs in farms across the country on every type of farm imaginable. The best part about buying a dog from a working family and environment is you know you are getting the best package for your money. Here at Uptown Farms, our dogs’ main purpose is to protect our livestock investments. This means we can only afford to have healthy, intelligent, loyal dogs running our farm. A sick dog is not out in the field working, so we breed to have the absolute healthiest dogs possible. Visitors come and go everyday which means our Pyrenees have to be able to distinguish between friend and foe on a daily basis. We need dogs that are bred to bond quickly and cherish that bond above all else so they stay at home and do their job. What does this mean for you? This means by purchasing a dog from Uptown Farms you are getting a dog that will come and protect you, your family, and your livestock at all costs. It means you will have a dog that is healthy. It means that you will have a dog that will bond with your family, your farm, or your flock. The greatest part about the Pyrenees is their inherent ability to distinguish the young and old. 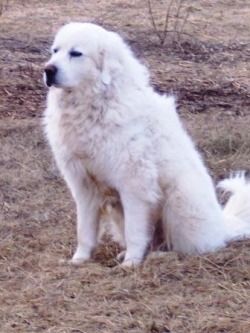 Whether it is a baby lamb, a young child, or your elderly neighbor, the Pyrenees can sense when they need to be gentle and kind. That same dog will be able to sense when they need to go into “guard mode” because a threat to your home or a threat to your stock. Bull was our stud for many years at Uptown Farms. He will be greatly missed. His personality, working instincts, and nature will all be passed on through Jack, his son. One of our pups, resting near the hay bales, watching the sheep. Pictured at 7 weeks, our pups learn their jobs almost as quickly as they learn to walk. Pups are born at the farm with careful watch from us but mostly handled by our girls. Our babies are exposed to livestock from the day they are born until the day the leave for their new families! Our pups get used to heat growing up in Missouri, but they still prefer winter days! A young pup already showing his guarding instincts as he just lies and watches! 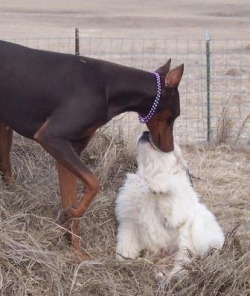 Foxy, Kate's house-dog, playing with one of the pups.